There are 28 custom PCBs on ELFIN. Four of these are provided by the Aerospace Corporation and one is provided by Astrodev. The remaining 23 PCBs are designed, populated, tested, and iterated upon by UCLA students. The complexity of these boards ranges from a simple auxiliary board to efficient, clean and configurable power supplies. The EE team is ultimately responsible for all of the flight electronics and hardware as well as necessary ground hardware. There are a myriad of GSE boards ranging from ELFIN interfaces to TVAC monitoring. 1. The responsibilities and features of a board are outlined by management and the EE team. Trade studies are performed and presented to management, where a top level path is decided upon. 2. A single student will take responsibility to do the PCB CAD (we use Altium). Mentorship is provided first by EE lead/peers and then by staff. CAD level reviews by staff are conducted regularly (depending on complexity) with the goal of catching mistakes early and making mid-course corrections before it is too late, as well as ensuring students follow good EE CAD practices. There are usually >3 reviews at this level with unanimous agreement to proceed. The board is then sent out to Advanced Circuits for fabrication. 3. Upon completion, the student will begin putting together Assembly Instruction Documents (AIDs). Since a lot of hand soldering was done by students (with mentorship), a fool proof and easy to follow AIDs is key to mitigating mistakes and preventing lost time. AIDs are formatted in PowerPoint; each slide is associated with a single component, circled, highlighted, with necessary warnings displayed. Hand soldering is also very order dependent, so students get to see why and how order matters. In general AIDs go through 2-3 rounds of reviews before being finalized. Staff mentors and technicians take part in the review, in addition to other peers who didn’t work the board to catch any overlooked/glaring mistakes. This is where many of the actual EEE components are decided upon based on radiation specs and what logistically feasible. Two examples of Assembly Instruction Documents. 4. From the AIDs, the student will then reference our EEE inventory, which tracks ~1000 components in our nitrogen purged dry cabinet. A bill of material is compiled and passed to management for approval and purchasing. 5. Upon arrival of EEE components, kits are created in kit boxes. Each box has 12-18 cubicles inside; the components are placed in each box in the order they appear in the AIDs. That way, technicians have another source to cross-reference to ensure have a higher chance of catching mistakes (i.e. if the next item in the kit box does not match the next item in the AIDs, that’s a red flag and would get escalated). 6. The EE student will create a QA checklist (which also gets reviewed). Upon completion of the board, the QA checkout will be executed. 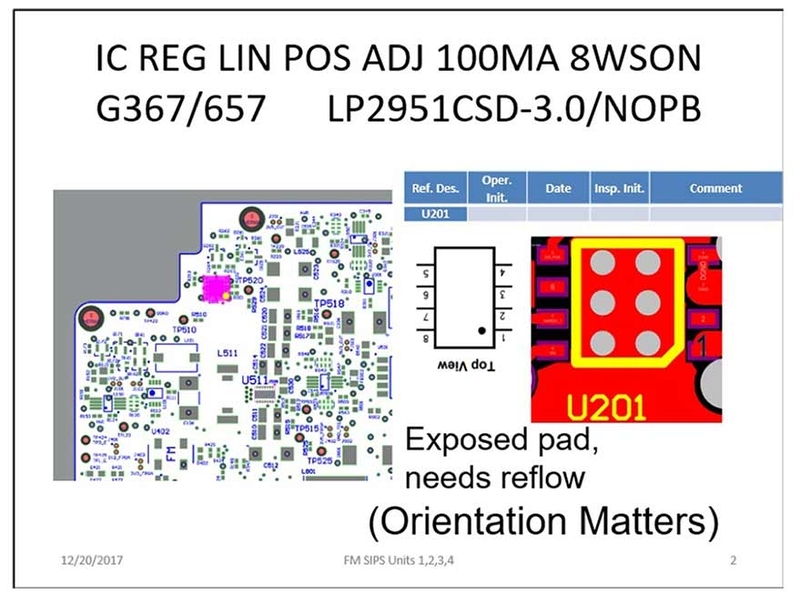 This usually includes first a visual inspection under the microscope (solder joints, correct components, proper orientations) before checking continuity between connectors, adjacent pins and pads, before powering the board and checking out its specific functions. Any errors/revisions here results in revisions of the AIDs or kits. An as-built schematic containing the exact components and any applicable rework is also generated. 7. The board is now complete until a future revision from other tests is deemed necessary. Once boards were electrically checked out, the majority of components would get staked down with 2216 epoxy. Taller components would get several layers of epoxy build up until it was satisfactory; the preamps took almost 2 weeks of continuously building up a few 2216 layers each day. Afterwards, another layer of conformal coat would then be applied. We used Arathane 5750 A/B thinned with Ultralane #1, as recommended by Aerospace Corporation, with the following mixing ratio of 4.5/25/25g (A/B/t) by weight. It was brush applied under a strong UV light, although we avoided connectors due to the ability of thinned Arathane to “wick up” connectors and render them inoperable. Thus, after all the glue was set and done, we precisely applied Kapton tape over all tight pitch connectors. Every single flight board received this treatment. A -X panel ready for flight.